Cataracts are the leading cause of visual loss in adults 55 or older. 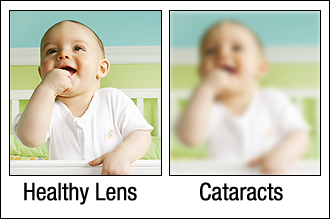 A cataract is a clouding of the natural lens inside your eye. This lens, located behind the iris, works just like the lens of a camera - focusing light images on the retina, which sends images to the brain. The human lens can become so clouded it prevents light and images from reaching the retina. Think of it as a dirty or cloudy window in your home. A cataract can be the reason sharp objects become blurred, bright colors become dull, or seeing at night is more difficult. It may also be why reading glasses or bifocals that used to help you no longer seem to be effective. Unfortunately, cataracts cannot be prevented. Eye injury, certain diseases, or even some medications can cause clouding, but the majority of cataracts are simply a result of the natural aging process. The best way to treat a cataract is with surgery that removes the old, clouded lens and replaces it with a new, artificial one to restore your vision and, in many ways, significantly renew your vision and improve your quality of life.